You might call her the Nancy Drew of genealogy. You can certainly make the case that she is the goddess of genealogy. Either way Mary Tedesco's love for family and its heritage has lead her on a journey through time as she looks to unearth the mysteries behind your heritage. Mary is the founder of Origins Italy, a genealogical firm that specializes in researching your Italian heritage. You may know Mary more as the co-host of the popular PBS television series Genealogy Roadshow. Mary along with co-hosts Joshua Taylor and Kenyetta Berry take you on an emotional journey as they search to uncover the mysteries behind diverse individuals looking to unlock the past. I had an opportunity to chat with Mary via email. We discussed her family, career and as you will see you get a little glimpse into her personal life. Can you tell me about your heritage? My paternal grandparents are Italian and my mother has very deep American roots (English, German, Irish, Danish). Where are your paternal grandparents from? My grandfather Edward J. Tedesco was born Fortunato Tedesco in San Pietro a Maida (CZ), Italy. My grandmother was Loredana (Stenech) Tedesco, and she was born in Rovereto (TN), Italy. My grandmother Loredana's mother, Tecla Pellegrini's hometown was Sarteano (SI), Italy. Have you had a chance to visit Italy and the town your family is from? Yes, I've had the privilege of visiting San Pietro a Maida (CZ), Rovereto (TN), and Sarteano (SI). Do you still have relatives in Italy? Yes, the cousins I'm closest to live in Rome. Did your grandparents have any specific traditions that they continued to follow and share with you as you were growing up? Yes, family meals on Sunday afternoon. In our family, my grandmother's kitchen was the central meeting place for the family. It was a special and caring environment to grow up in. What is the one thing about being Italian that you love the most? How far back were you able to trace your family heritage on your father's side as well as your mother's side? Great question – I get asked this all the time. The best thing about genealogy is that the journey is never completed! I've traced many of my family lines back into the 1600's – 1700's. A couple of my mother's New England lines are very well documented by other professional genealogists, and reach back into the 1500's. It's important to remember that is not quantity with genealogy, but the quality of the research. What fueled your passion to become a professional genealogist? My parents and grandparents – I wouldn't be where I am today without my wonderful family. They encourage me to follow my dreams! How does one become a professional genealogist? Is there a specific degree one can get or is this something that you have to learn on your own? Many professional genealogists are self-taught. There are numerous educational opportunities such as the Genealogical Research Certificate Program offered by Boston University. There are also genealogy conferences, seminars, webinars, books, institutes, and other educational avenues to hone and develop your genealogical skills. This learning is a lifelong endeavor. You are the founder of Origins Italy. Can you give me an overview of Origins Italy and the services you provide? To find your Italian roots whether you're seeking one specific ancestor or your entire family tree. To research all available Italian records to research your Italian family history. To augment your own Italian genealogical research by providing consulting services for those who wish to trace their own Italian roots. To provide services for obtaining Italian Dual Citizenship. To provide onsite research services in Italy to ensure accuracy and authenticity. Please contact us for additional information @ http://www.originsitaly.com/contact/. How often do you travel to Italy to do research? In recent years, I've taken 1-3 trips to Italy per year to conduct ORIGINS ITALY client genealogical research. The length of each trip has varied from about a week to over two months. It's a privilege to research onsite Italy on behalf of our valued clients. While there, we consult genealogical records that are only available in Italy and often hold priceless discoveries and insight into our clients' family histories. What advice can you give someone who wants to learn more about their heritage? 1. Begin at home. Ask your older relatives about your family's Italian origins and if they have any family documents or letters from Italy. The older generation is a priceless commodity to family historians. They know stories that no one else in the family knows. 2. Continue research online. After asking family members for genealogical information, I'd recommend researching online. There are many genealogy websites, some are free and others require a paid subscription. 3. Take it local. Online genealogical research is just the tip of the iceberg. As your research continues, you'll inevitably need to visit local repositories both in the USA and Italy to trace your ancestors. This can be great fun, and the perfect way to walk in your ancestor's footsteps! There are a number of online resources dedicated to genealogy. In your opinion, which resources should people, who want to learn more about their heritage, use? Start with www.FamilySearch.org. Search the online catalogue for your Italian ancestral town. Civil Records for many Italian cities towns have been digitized or microfilmed by FamilySearch. It's a great place to begin your Italian genealogical journey! You wrote the publication "Tracing Your Italian Ancestors." What can I learn from this and can you tell me how I can purchase this issue? "Tracing Your Italian Ancestors" is an excellent resource for learning how to research your Italian family history. My co-author Marcia Iannizzi Melnyk and I are very proud of the material covered, which includes: Getting the Basics; Researching in Italy; Visiting Ancestral Villages; Locating NARA Records; Home and Family Records; Passenger Manifests; Italian Church Records; Italian Civil Records; Italian Notary Records; and Italian Military Records and more! 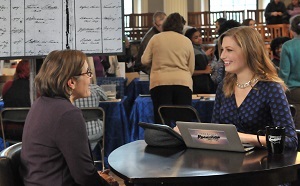 How did you get involved with the PBS show Genealogy Roadshow? In 2014, the producers of Genealogy Roadshow were looking for a third co-Host for season 2. I am most grateful that my co-Hosts, Josh and Kenyatta recommended me for the job. It's a privilege to work with our production team and the PBS team. Tell us a little bit more about the show. How are people selected to be on the show and how long does it take to complete an episode? 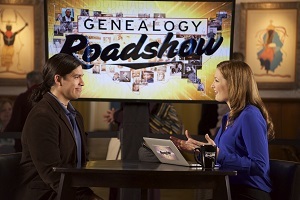 Genealogy Roadshow is the perfect complement to the mega-trending family history movement in America. People really want to find out from where they came; to whom they are related; and, by association, who they are. The series brings to the TV audience personal family histories–stories that unfold in surprising and often emotional ways; stories that make you laugh, make you tear up and cry, or maybe just nod and smile. Transcending nationalities, ethnicities, races and cultures, the program underscores the noble idea that we share life through understanding and empathy. I think Genealogy Roadshow illustrates that people are not so different from one another, but are a part of the same humanity. Or as my great grandmother always said, "All people are like us." Is there a specific episode of Genealogy Roadshow that surprised you or that you were more enthusiastic to do? It is interesting to film each episode of Genealogy Roadshow. Traveling to many American cities and learning interesting details about the local history, heritage, and population of each city is fascinating. Genealogy Roadshow is the people's show. Each of our guests is just like you and me. Every family story is special and deserves to be remembered, preserved, and passed down for many generations to come. What challenges have you encountered hosting a show? Thankfully, we have a fantastic production team who are able to navigate any challenges that come up during the filming of Genealogy Roadshow. I'm grateful to work with them and be part of the team. You co-host Genealogy Roadshow with Kenyatta Berry and Joshua Taylor. Did you know either of them before the show? Josh, Kenyatta, and I were acquainted before “Genealogy Roadshow” through genealogy conferences. Have you learned anything from co-hosting the show that you would have never encountered working on your own? I've learned so much from being a co-Host on Genealogy Roadshow. Each guest on Roadshow is on a journey of discovery about his or her family history. I'm grateful to our producers and PBS team for their guidance and encouragement along the way. Are there any new projects you are currently working on? Yes, I'm thankful to be busy with many ORIGINS ITALY client research projects and speaking engagements. ORIGINS ITALY is currently taking new clients, and we look forward to helping our current and future clients discover and embrace their Italian roots! What is the one app on your phone you use the most? Can you tell me one thing that people might be surprised to find out about you? Sardinia is the only Italian region I haven't been to yet! I'd love to visit and / or research there in the next few years. It's so hard to choose just one! I love classic Italian cinema. My grandmother and I loved spending hours watching Italian films from the 40's, 50's and 60's. Anna Magnani is my favorite Italian actress. Her authenticity, talent, and passion come through in all of her roles. What type of music do you like to listen to and who is your favorite artist/band? I have an eclectic taste in music and listen to everything from Italian operas to the latest popular music. Stuffed artichokes, just like nonna used to make! Do you have time for hobbies or interests? What thing do you enjoy doing the most in your free time? Believe it or not, genealogy! As you can see Mary has a true passion for genealogy. If you haven't already done so please make sure to catch Mary on the popular show Genealogy Roadshow.